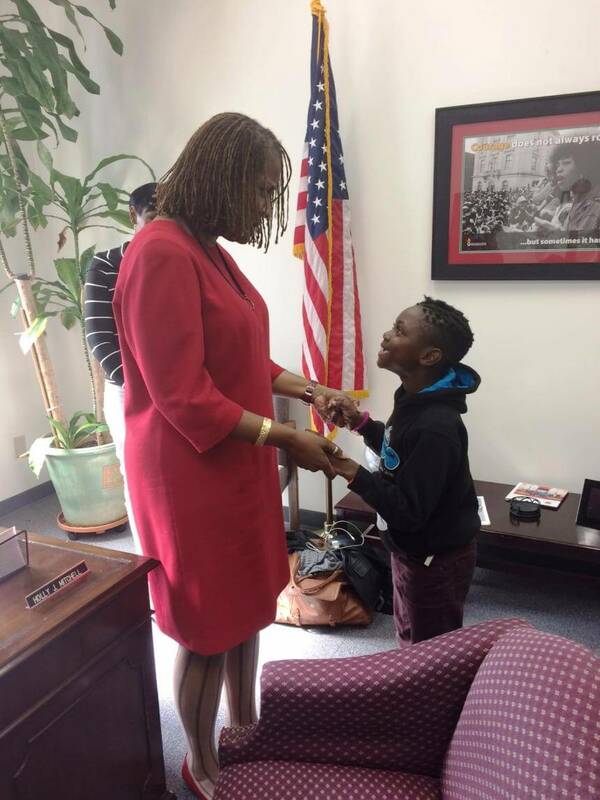 California State Senator Holly Mitchell, who fights for children, focuses on the little details. When working with colleagues and young women, she brings her years of policy-making experience to the table. She teaches young women who want to get involved in the political sphere to identify the specific, deeper meaning to why they want to get involved and run for office. It’s one thing to say that you want to run for office, but for Holly Mitchell it’s most important to know how and why you want a spot at the political table. Q: At College Magazine we’re working together with EMILY’s List, Emerge America, Human Rights Campaign, Higher Heights, Running Start, She Should Run, Victory Fund and IGNITE on an initiative to fight for equal representation in Congress called “50 by 2050.” What are your thoughts on the goal of achieving 50% of women in Congress by 2050? A: What will be most important is now that you’ve set that goal, how do you back into it, from a project planning perspective. Look at the women in Congress, how they got there and what the trend is for the future. I think that it’s important that as you establish that goal for 2050 we then back into it so that we’re filling the pipeline with women who will be primed and ready to make that happen. I just finished teaching last semester a leadership class as their Public Service in Residence at Mount St. Mary’s University here in L.A. in my district. And what I found was the most of the young women were interested in understanding, from a practical perspective, my trajectory. What they didn’t see so clearly, which is what folks don’t often talk about, is how you get there. You know, literally, practically, how you get there. So that’s what they were the most interested in, and what they really queried me about the most, in terms of what I did professionally and personally to build a base to actually make my first race happen in 2010. And so I think that’s the kind of thing that we need to be mindful of, to help young women actually see themselves and understand the steps they need to take as soon as now to prepare themselves for that ultimate run. Q: What inspired you to get involved in the political sphere and develop your campaign and platform you needed to run? A: I began to build before I made the decision. And that’s the point. If you don’t start to build until after you decide to run it could be too late. And so the strategies you use leading up to that decision are building networks, being involved and showing your leadership acumen in your community. So there’s the practical ways of building a database, of collecting business cards and making notes so you can reach people down the line. But there’s also the impression you leave and practicing leadership all along. A lot of young women in my class said that they wanted to run for office. And when we dug deep into the why, sometimes it wasn’t quite so clear. I ran for office based on years of working and building expertise in specific policy areas. I had spent decades working in the field, working on policy development, developing that expertise and ran based on that experience and knowledge. And so as we talk about preparing to run, it’s also important to make sure that you have a body of knowledge valuable to the electorate. I don’t call myself a politician. I call myself a policy-maker. I didn’t run for office on any sense of ego or desire [for] politics. Politics [are] the means by which I make and facilitate sound policy-making. And when I think of why women tend to run for office it’s based on substance and what they bring to the table. And so when I talk to young women about having an interest, on how to be truly valuable to the electorate, they have to bring something to the table. It’s not just about running for office. I am a working family, women’s advocate and children’s advocate who ran for office to forward an agenda. Q: Over the last few months in particular, we’ve seen more women running for office and getting involved in that process. How do you feel that will end up shaping the political sphere of this country? A: I was in my process [of] figuring out whether I should run or not, and I was at the doctor’s office and I picked up a magazine that I wouldn’t have normally touched. I was going through it and I saw an article by a former elected official (I want to say that she was from Colorado) who talked about her decision to run. She had amazing practical experience in the field of education, and she didn’t think that it was applicable in the field of policy making. It wasn’t until years of people trying to recruit her she realized that (and these are her words) her ordinary life experiences were valuable to the policy-making area. And I think women, and their ordinary life experiences, the way in which women approach problem solving and leadership, are the exact characteristics that are valuable in the policy making arena. And that’s why more women should run for office. Q: How did your work with Crystal Stairs and the Western Center on Law and Poverty prepare you for your career as legislator? A: For the Western Center, I really had the opportunity to work and represent the needs of low-income working families. And I got to figure how to truly be a grass-tops advocate helping those people in those communities and bringing their voice to the room when they weren’t present. As the CEO of Crystal Stairs, I learned how to be an effective leader, how to be the kind of boss I would want to work for and how to really manage. As the Chair of the Senate Budget Committee this year, most of the compliments I’ve got from my colleagues [were] my ability to lead them through a process that was going to ultimately lead them to their goal of balancing a $183 billion budget. Leading an organization of around 500 employees really taught me and helped me hone my leadership skills. I think that sometimes people don’t understand the valuable role those skills play in being an effective policy-maker who has an agenda and can get the agenda through the floor of legislation. Q: At College Magazine, we’re the guide to the undergraduate experience. In what ways did your college experience at University of California at Riverside prepare you for your experiences in politics and public service? A: My experience at UC Riverside really helped form my leadership chops and my ability to fight to prove myself. I was at UCR at a time when it was the most conservative campus of the then nine UC campuses. I learned a lot about advocacy and lobbying, and frankly, I learned how to stand up and fight. Those were tough times to be a student at UC Riverside and the UC system as a whole. When I think back to that time, those are the images and ideas that come to mind. I was at UC at a time when we were having protests. So I again learned how to organize and be a part of a broader campus community in terms of garnering support for the student body. We had very few tenured professors of color on the campus at the time, so we sometimes had to go outside the campus and the classroom to get guidance, direction and support that we needed. Our chancellor the first couple years I was on campus was a great guy who gave that support. He died while serving as chancellor and we went through a leadership transition and then ended up with a chancellor who wasn’t as supportive with us. Those were interesting times, and I learned a great deal about myself and about leadership. A: We have a goal statement that’s in our office that shows our focus as a team. It’s not just me; I lead a team at a Capitol Office and District Office. And it’s important that as a leader I can communicate to my team what my collective goal is so we can be successful on behalf of the one million residents I represent in the California State Senate. And so our goal is to develop policies and identify funding resources and impact regulations to create a California in which all children thrive. I realize that over the last couple years that we’ve been in kind of a defense mode and scurrying around to prevent further harm to children by program elimination and closure. I want to create a state that has resources available so all children can be the best they can be. That benefits me as a Californian and the state as a whole because we’ll have educated, trained and equipped workforce that’ll take California into the future that’ll allow us to be the innovate state we have historically been. So our goal is to create a California in which all children thrive—children in the juvenile justice system, children in child welfare services, children whose families can’t afford the additional services that we all try to provide to make our children get ahead. To make sure that children have housing, and great outdoor spaces to play in and great public museums. Q: Did you, and do you still, face any challenges as an African-American woman running for office? Anyone who knows me, whether they like me or not, I think broadly will say that I’m always prepared, know what I’m talking about and not afraid to take on a challenge and debate you on the facts on a policy issue. That’s the attitude and perspective that I bring to every room that I walk in, and I’m hoping that young college women who are reading your periodical begin to envision themselves in that context and recognize that it’s not about me trying to fit into a model to get along. It’s about other people having to deal with the power that I bring to the situation. Q: Do you have a moment or a project that you were/are involved in that has been the most rewarding of your career so far? 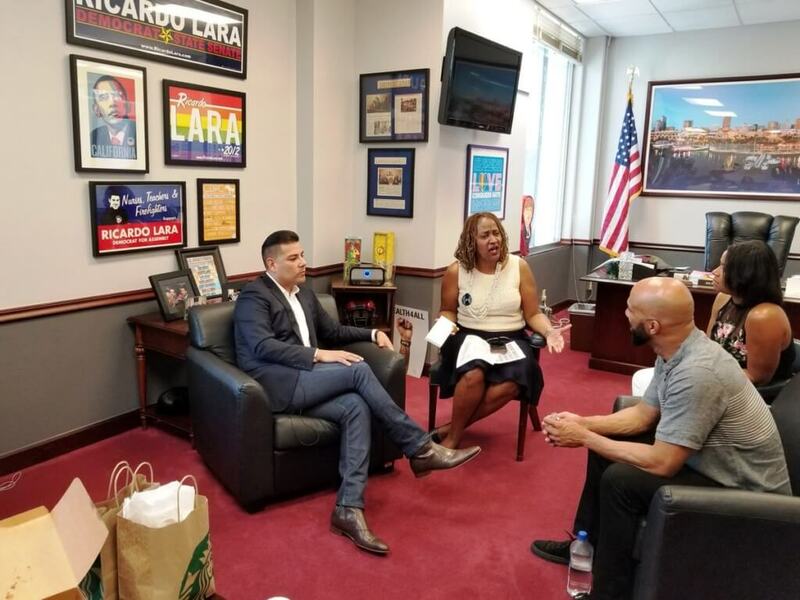 A: I got a couple of big wins, but right now I am in the middle of carrying a package of seven bills that I’m partnering with a colleague Senator Ricardo Lara. And it’s a novel approach, and we don’t know if anyone’s ever done it before, where we are true equal partners (author and principle co-author) of all seven bills. And we’re calling it our Equity and Justice package #equityandjustice. See, Ricardo’s younger than I am, he’s a millennial, and so we’re trying to be hip. The whole focus of all seven bills is juvenile justice reform. And if I sit and listen to people who opposed to bill, some of the traditional law enforcement organizations, I realized that we’ve gotten to a place in society where we criminalize children in many instances of behavior that are not criminal. [But] children are not adults and that we as a civil society have to acknowledge that adolescents and not treat them as adults in the criminal justice system. That we have to understand brain development and ages and stages of development, and hold children accountable in accordance with their emotional and social development. And not lock them up and throw away the key. This body of seven bills I think will create a culture shift on how we treat and perceive children who are at risk. “My bread and butter is children and social service and healthcare delivery service. So that’s why I’m at the state level of government. I would have not run for City Council based on the nature of the work that the City Council is responsible for. Before you decide to run for office, you have to figure out what issues you’re passionate about and then match your passion to the scope of service for the office. 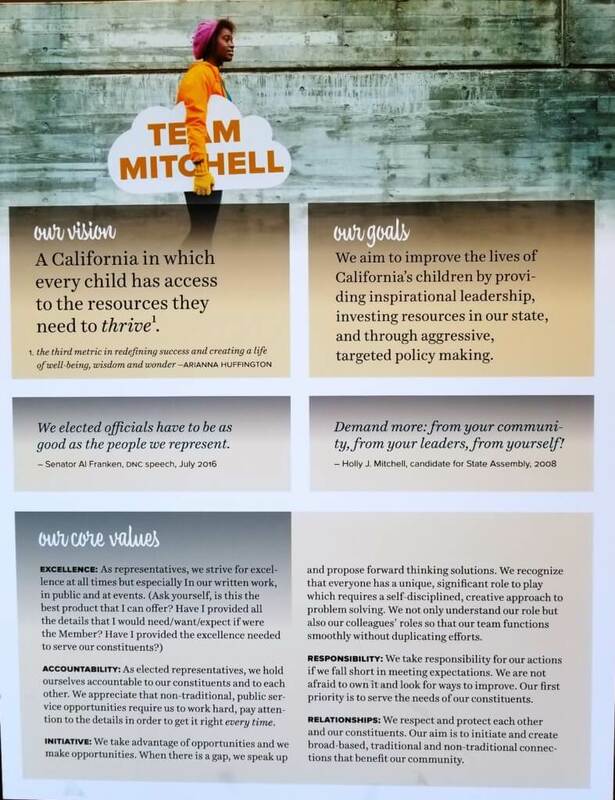 Identifying the policy area that you’re passionate about has to be your first step in order for you to figure out what office makes most sense for you to run for,” said Mitchell. “Work for a campaign, volunteer or give your time for an elected official focused on an issue that you can deeply, personally believe in and connect to. When you go the extra mile, when you’re walking in a precinct on a Saturday or Sunday in the hot sun, where folks are slamming their doors in your face, when folks are hanging up on you when you’re phone banking, you have to be able to tap into a place that helps you pick up the phone and dial the next number. Which means that you really believe in the cause or issue that you’re trying to put forward,” said Mitchell. Talk to her at her Capital Office or Los Angeles District Office.